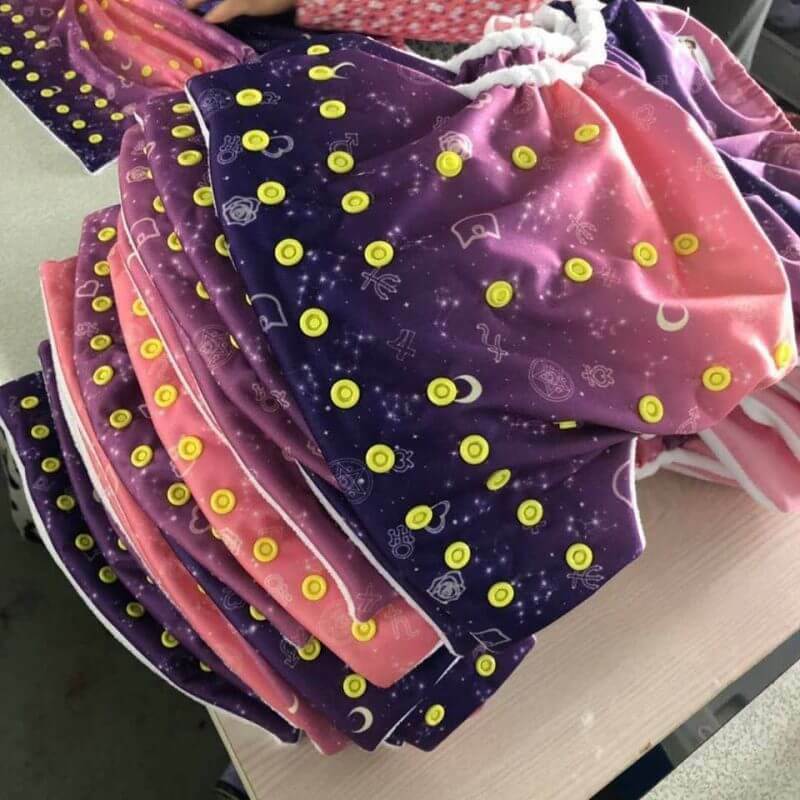 Let me start off by saying that if you are looking for an affordable brand of cloth diapers that is well made, I recommend you looking into Nerdy Mommas. One thing that really makes Nerdy Mommas stand out are their custom designed fandom inspired prints! Two of my personal favs are Encrypted and Senshi Skies. Encrypted is covered in quotes that have been translated into binary code from movies like Star Wars, Lord of the Rings, Ghostbusters, Jurassic Park and of course, The Matrix! I love the twilight sky that is inspired by the Sailor Moon on the Senshi Skies print. Plus, the colors are just stunning! Pocket cloth diapers including a bamboo insert and are $14.99. All in ones are $17.99. One size covers are also available for $12.99. I received the Nerdy Mommas Pocket Diaper with a bamboo insert as well as an all in one. She also threw in a wetbag and change mat. Products were received for review purposes. However, all opinions stated here are honest and true. My first impressions of everything was that it is all well made. The PUL especially seemed to be really high quality. I was really blown away by the all in one and wet bag. Nerdy Mommas All in Ones have two semi attached bamboo blend inserts. This style allows them to wash and dry easier. There’s four rise settings that allow it to fit newborn to 40 lbs. Remember any sizing you see is only a guide. All babies are different shapes so the diapers will fit each a little different. Norah is sorta short and solid. She’s 31 lbs now. 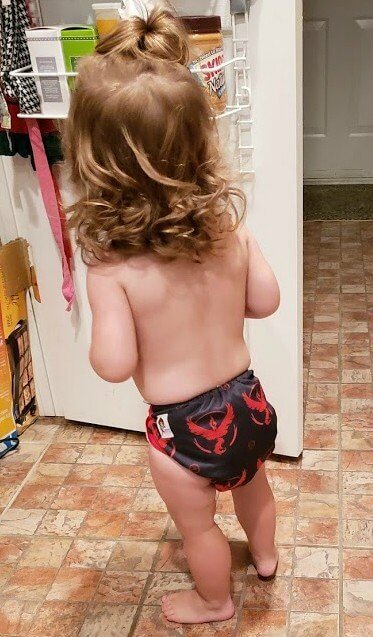 She still has lots of room to grow in these! The all in one also has stretchy tabs and double leg gussets. I really like double leg gussets because they allow you to get a great fit really easily. That makes this a good choice for caregivers as well. The website mentions these as a good option for nights. I think that on its own it would be good for a light wetter at night. But for more protection it would be easy to add another insert. 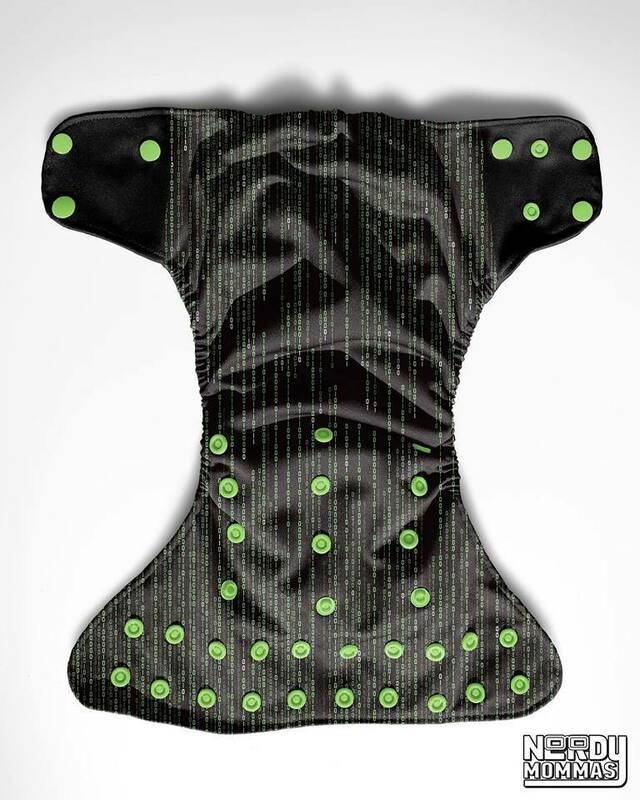 The Nerdy Mommas all in one is great because it is pretty trim while still being absorbent enough. Also, the attached bamboo inserts still lay completely flat. The nerdy prints are beautifully design and just another great plus! 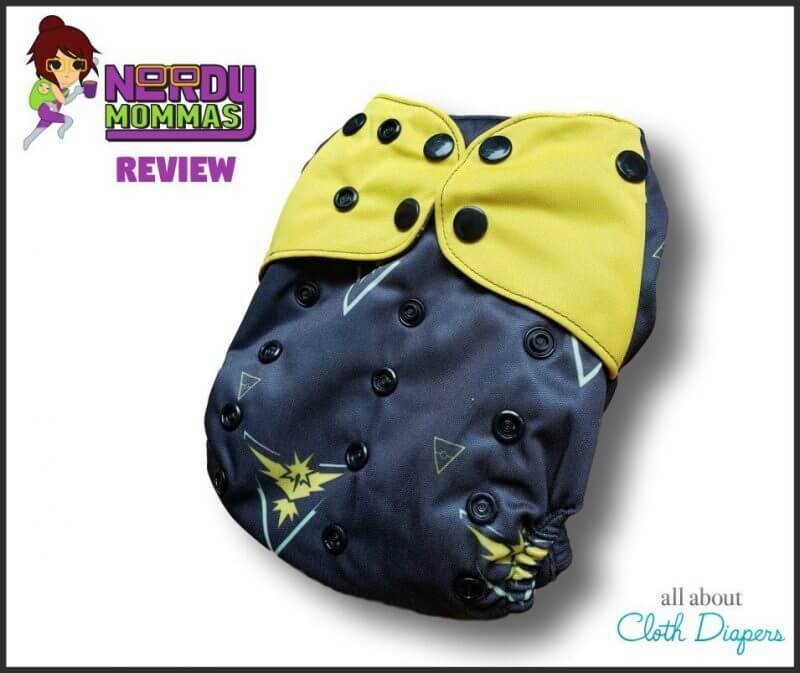 Ok, let’s chat about the Nerdy Mommas Pocket Cloth Diapers! They come in TWO sizes. The regular is newborn – 40 lbs. 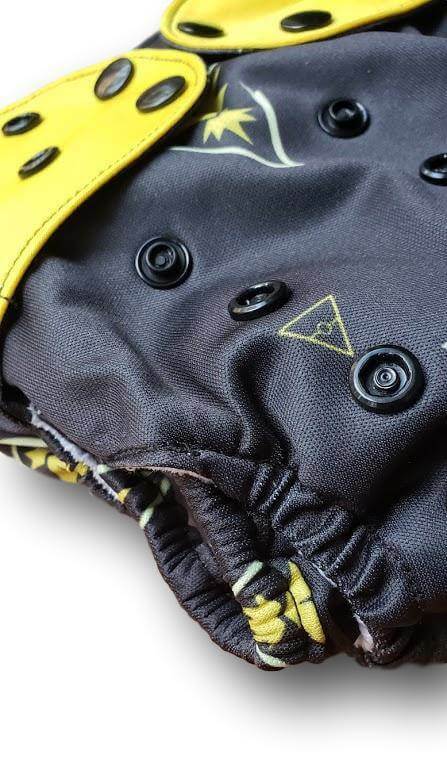 The Big Kid Pocket is designed to fit 24 – 55 lbs! That’s great for bigger toddlers or special needs kids. Their pocket diaper comes with one 4 layer bamboo insert. The liner is a soft fleece. The elastic opening at the back allows the insert to agitate out in the wash. Big plus! I refuse to use diapers that don’t do that. I won’t fish soiled inserts out of pockets. YUCK! 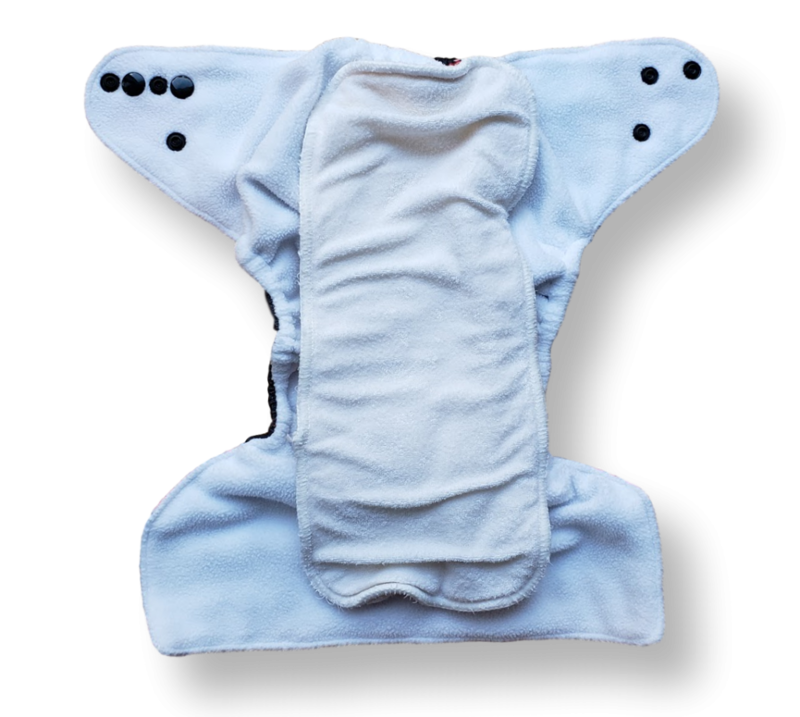 The pocket diapers also feature stretchy tabs, four snap rise settings, and cross over snaps for smaller babies. I’ve been using these for about three months now. They’ve held up well so far. The bamboo insert is a little bit wavy. But this is fairly normal for this fabric blend. I like how they fit on Norah. They look really trim on her! The wet bags are 11″ x 16″. This makes them a perfect size for a day out bag. I would say it holds up to 8 cloth diapers. What rocks my socks is just the sheer quality of the bag. The waterproof PUL is super good. 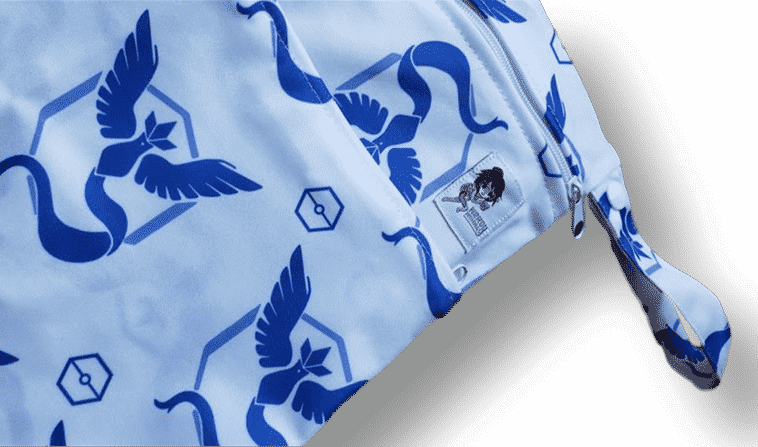 And it’s got two separate zipper pockets. The larger for your soiled diapers and the smaller for clean necessities like cloth wipes, spray, or a small rash cream. If you need a wet bag, these are a GREAT option. I just quickly want to mention the Nerdy Mommas change pad. High quality waterproof PUL on one side and soft fleece on the other side. They are pretty big at 30″ x 30″. It’s a great option if you need one and is priced at $14.99. 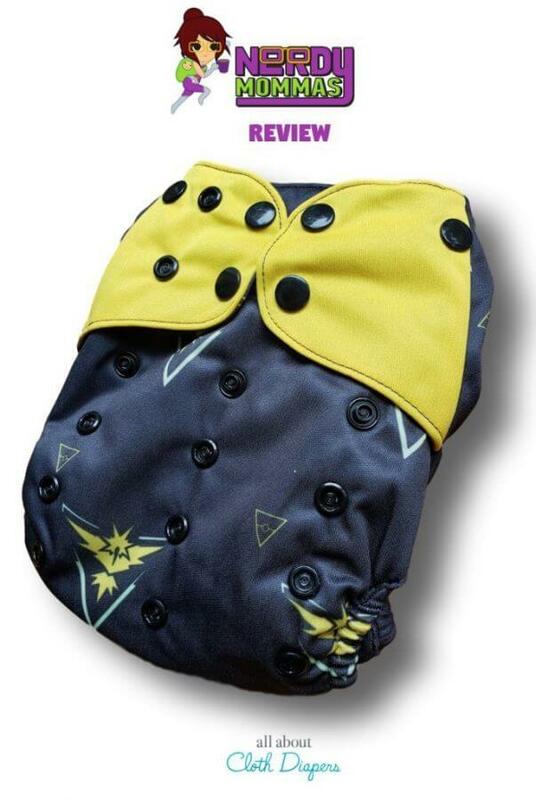 I didn’t receive a cover to review, but if you are interested, they are a one size birth to 40 lb cover that features double leg gussets and four snap rise settings. I love that they have unique custom prints. But what I LOVE even more than that is that Annie, the owner, is the artist that creates the designs. I’d love to see hemp inserts. They were in stock for a while and are expected back eventually. When they do become available, I’d love to get my hands on one to give them a try! Make sure you check out Nerdy Mommas. They will be stocking new diapers on Monday, February 11th!